WHY? You're the sensible one in the band. You've got a big show in a couple of weeks, and your six-stringer needs to get their gear ship-shape. The thing is, everyone knows if you lend a guitarist money for repairs, they’ll just spend it on an obscure pedal someone fished out of a skip. Get your virtuoso something they actually need. 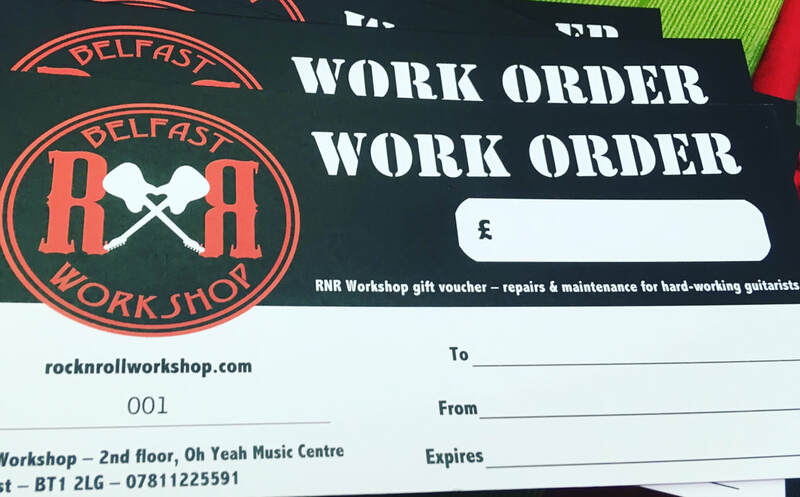 Give them an RNR Workshop Work Order. Or maybe your friend/other half is awfully good to you, and they could do with having their troublesome guitar made a little nicer. Bless ya, you're a saint. They'll thank you for it. How do I get my hands on this momentous certificate of love and generosity? Just come to the workshop and pick one up. This is a fairly low-tech environment. I take some details with payment, you get a receipt, and take the voucher.